Home Run and Grow Operations Does Your Business Have Standard Operating Procedures? When it comes to be being successful in business, consistency is one of the driving factors. Companies that can consistently produce quality products that customers depend on will find greater success than those that haphazardly meander through their production processes. SOPs are used in several industries, though they differ from company to company. For example, Arbour Group consults with clients in the life sciences field where companies are expected to produce products that meet very specific, predetermined specs throughout their supply chains. This means standard procedures must be put in place to reduce errors and ensure product quality that meets industry requirements. Consistency in output. A small business that’s just getting up and running can deal with some inconsistencies here and there. But when it comes to a large, established organization, consistency isn’t something to be taken for granted. A lack can lead to customer attrition and even lawsuits. SOPs establish systems for achieving greater consistency in output. Time and money savings. “When the same task is completed in many different ways, it will always take longer to complete. Having a standard operating procedure in place streamlines the process so employees can accomplish more in less time,” project manager Jamie Johnson writes. And wherever there is time savings, there are also cost savings. SOP’s yield businesses both. Enhanced communication. When there are standards in place for how processes are handled, there’s less internal friction. Employees know what’s expected of them and there’s rarely confusion over who does what or how a particular task is accomplished. Lower risk. When it’s all said and done, SOPs are about reducing business risk. Standard procedures provide a greater sense of control, which benefits all parties involved. Some businesses are required—either by state governments or regulatory boards – to establish certain SOPs. Other organizations are not. However, even for those that fall into the latter category, there’s significant value in establishing procedures so that some of the benefits above may be realized. Start by developing a comprehensive list of all the business processes that need to be standardized within your company. It may be helpful to approach this challenge by walking your way through the supply chain from start to finish. Other companies find it easier to take a department by department angle. Feel free use any method you want, so long as you don’t have processes slipping through the cracks. When it comes to writing out SOPs, you’ll have to think about formatting. 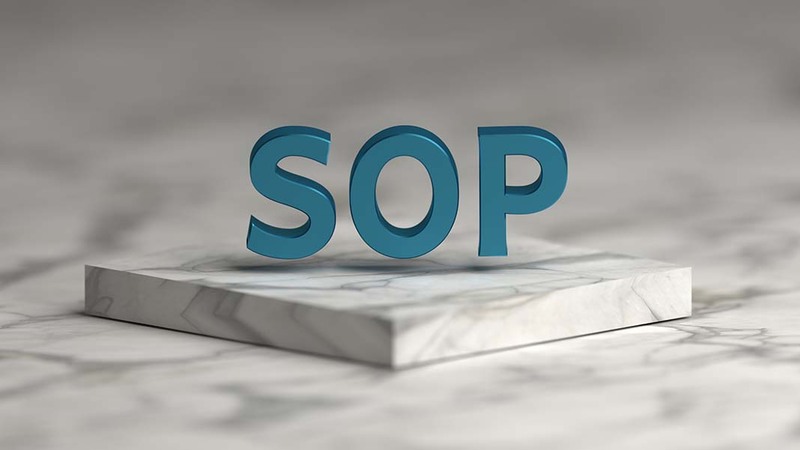 If you’re required by some a board or governing body to develop SOPs, ask if there’s a certain SOP framework they need. ISO 9001 standards are quite common, for example. If you’re doing it on your own, then feel free to find any template that suits your personal preferences. It’s unwise to develop SOPs without the input of the people who will be carrying them out. During the brainstorming process, meet with employees and develop cross-functional teams to help you sort through the details. Finally, it’s time to write the processes out. Be as detailed as possible, while still be concise and straight to the point. For best results, have your SOPs reviewed by a third party. Standard operating procedures are immensely valuable for businesses that need to promote efficiency and ensure consistency. Whether you’re required to or not, you should consider establishing your own SOPs to save your business money and lower risk. An investment in this area of your business won’t be returned empty-handed.